Ah yeah! It’s coldish outside, so the oven is a busier place in my house. 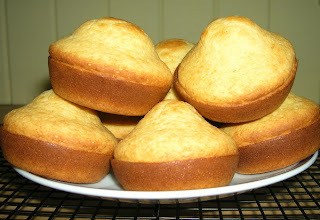 I spent last weekend making a batch o’ cornbread. There’s no need for honey when you use maple syrup, but I can’t fault ya if you wanna indulge with the sweetness. Coupled with a quick vegan chili recipe, I quickly polished off this meal last weekend ... too quick in fact — I didn’t even think to take pics of the chili. Morningstar Farms’ recipe couldn’t be simpler. As much as I’d love to let a pot of chili bubble all-damn day, I just don’t have the time for that. Anyway, the faux-meat crumbles are excellent. I plan on using them in a stuffed bell pepper experiment later this week, so look for that. DUCK SEASON! RABBIT SEASON! NO DUCK SEASON!